The operator of the E-government portal and the National Certification Services Centre - the Data Processing Centre of the Ministry of Communications and High Technologies signed a contract with Microsoft Azerbaijan. The document was signed by Director of the Data Processing Centre Elnar Asadov and Head of Microsoft Azerbaijan Sarhan Hashimov. 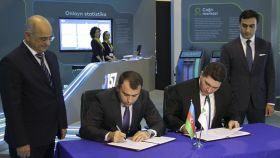 The contract was signed within the project on creation of Public Key Infrastructure for using electronic signatures in new generation ID cards in accordance with Section 2 of the Order of the President of the Republic of Azerbaijan “On additional measures for the application of new generation ID cards in the Republic of Azerbaijan”. Note that new generation ID cards, which are considered one of the largest ICT projects implemented in recent years, will provide all citizens of the country with electronic signature certificates. The main advantage of new generation ID cards is that they will increase the level of citizen satisfaction by ensuring convenient use of electronic services. The contract signed on 30 November is considered to be one of the most important steps in the development of e-government.